The Sudanese Republic and Senegal became independent of France in 1960 as the Mali Federation. When Senegal withdrew after only a few months, what formerly made up the Sudanese Republic was renamed Mali. Rule by dictatorship was brought to a close in 1991 by a military coup - led by the current president Amadou TOURE - enabling Mali's emergence as one of the strongest democracies on the continent. President Alpha KONARE won Mali's first democratic presidential election in 1992 and was reelected in 1997. In keeping with Mali's two-term constitutional limit, KONARE stepped down in 2002 and was succeeded by Amadou TOURE, who was subsequently elected to a second term in 2007. The elections were widely judged to be free and fair. 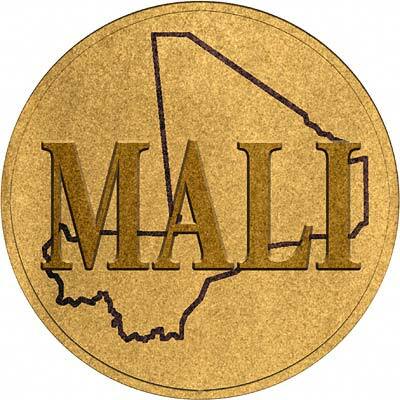 For silver and base metal coins of the Mali, please look at our original Chard Coins website. We make an active market in almost all world coins, gold or otherwise, including Malian gold coins. If you have any of these coins to sell, please contact us, or post them to us for appraisal and offer.